If you’re like many Americans, you look forward to having a nice lie-in on the weekends. But a new study finds this might be hurting your health and ruining your waistline. If you’re sleeping in on the weekends in hopes of catching up on lost ZZZs, well, new research finds it may not be beneficial. The study randomly assigned 36 healthy adults to one of three groups. Two of these groups were sleep-restricted, while the third group was allowed to sleep as long as 9 hours every night. (WXYZ) — If you’re like many Americans, you look forward to having a nice lie-in on the weekends. But a new study finds this might be hurting your health and ruining your waistline. If you’re sleeping in on the weekends in hopes of catching up on lost ZZZs, well, new research finds it may not be beneficial. The study randomly assigned 36 healthy adults to one of three groups. Two of these groups were sleep-restricted, while the third group was allowed to sleep as long as 9 hours every night. What was found, was that the two groups that were sleep-deprived ended up snacking more at night and gaining more weight. So why would this be happening? Well, it’s likely because hunger hormones are affected when you don’t sleep enough. Leptin, which decreases your appetite drops. And ghrelin, which increases your appetite rises. So you’re left feeling hungry. Now you might think that sleeping in on the weekend might be helpful. Well, one of the sleep-restricted groups did get to do this. 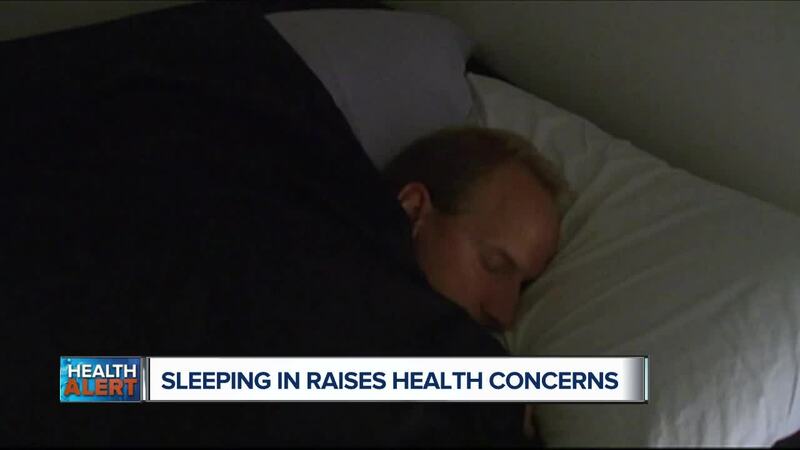 But the researchers discovered that it was still not enough to balance out the health effects once the participants returned back to sleeping shorter hours. What they found was that the shorter sleep times affected the body’s ability to regulate blood sugar properly. This can increase the risk of metabolic disease which can up your risk for diabetes, stroke and heart disease. Aim for at least 7 hours of sleep a night. Some folks will need as much as 9 hours. Try setting an alarm at night. This will remind you it’s now time to head to bed. Get some movement with purpose in your life. Regular exercise can certainly help you sleep better. If you have trouble falling asleep, be sure you’re not drinking caffeinated drinks too late in the afternoon. Also nicotine and alcohol can be stimulating as well. Now I hope you’ll follow my prescriptions and if you do, you’ll be on a better path for a healthier life overall.